Constantine Samuel Rafinesque-Schmaltz, as he is known in Europe (October 22, 1783 – September 18, 1840), was a nineteenth-century polymath born near Constantinople in the Ottoman Empire and self-educated in France. He traveled as a young man in the United States, ultimately settling in Ohio in 1815, where he made notable contributions to botany, zoology, and the study of prehistoric earthworks in North America. He also contributed to the study of ancient Mesoamerican linguistics, in addition to work he had already completed in Europe. Rafinesque was eccentric, and is often portrayed as an "erratic genius". He was an autodidact who excelled in various fields of knowledge, as a zoologist, botanist, writer and polyglot. He wrote prolifically on such diverse topics as anthropology, biology, geology, and linguistics, but was honored in none of these fields during his lifetime. Today, scholars agree that he was far ahead of his time in many areas. Among his theories was that ancestors of Native Americans had migrated by the Bering Sea from Asia to North America. Rafinesque was born on October 22, 1783 in Galata, a suburb of Constantinople. His father F. G. Rafinesque was a French merchant from Marseilles; his mother M. Schmaltz was of German descent and born in Constantinople. His father died in Philadelphia about 1793. Rafinesque spent his youth in Marseilles, and was mostly self-educated; he never attended university. By the age of twelve, he had begun collecting plants for a herbarium. By fourteen, he taught himself perfect Greek and Latin because he needed to follow footnotes in the books he was reading in his paternal grandmother's libraries. In 1802, at the age of nineteen, Rafinesque sailed to Philadelphia in the United States with his younger brother. They traveled through Pennsylvania and Delaware, where he made the acquaintance of most of the young nation's few botanists. In 1805 Rafinesque returned to Europe with his collection of botanical specimens, and settled in Palermo, Sicily, where he learned Italian. He became so successful in trade that he retired by age twenty-five and devoted his time entirely to natural history. For a time Rafinesque also worked as secretary to the American consul. During his stay in Sicily, he studied plants and fishes, naming many new discovered species of each. He was elected a Fellow of the American Academy of Arts and Sciences in 1808. Rafinesque had a common-law wife. After their son died in 1815, he left her and returned to the United States. When his ship Union foundered near the coast of Connecticut, he lost all his books (50 boxes) and all his specimens (including more than 60,000 shells). Settling in New York, Rafinesque became a founding member of the newly established "Lyceum of Natural History." In 1817 his book Florula Ludoviciana was strongly criticized by fellow botanists, which caused his writings to be ignored. By 1818, he had collected and named more than 250 new species of plants and animals. Slowly he was rebuilding his collection of objects from nature. In 1819 Rafinesque became professor of botany at Transylvania University in Lexington, Kentucky, where he also gave private lessons in French, Italian and Spanish. He was loosely associated with John D. Clifford, a merchant who was also interested in the ancient earthworks which remained throughout the Ohio Valley. Clifford conducted archival research, seeking the origins of these mounds, and Rafinesque measured and mapped them. Some had already been lost to American development. He was elected a member of the American Antiquarian Society in 1820. Rafinesque started recording all the new species of plants and animals he encountered in travels throughout the state. He was considered an erratic student of higher plants. In the spring of 1826, he left the university after quarreling with its president. He traveled and lectured in various places, and endeavored to establish a magazine and a botanic garden, but without success. He moved to Philadelphia, a center of publishing and research, without employment. He published The Atlantic Journal and Friend of Knowledge, a Cyclopædic Journal and Review, of which only eight issues were printed (1832–1833). He also gave public lectures and continued publishing, mostly at his own expense. 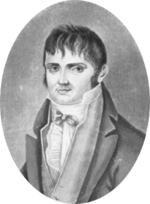 Rafinesque died of stomach and liver cancer in Philadelphia on September 18, 1840. It has been speculated that the cancer may have been induced by Rafinesque's self-medication years before with a mixture containing maidenhair fern. He was buried in a plot in what is now Ronaldson's Cemetery. In March 1924 what were thought to be his remains were transported to Transylvania University and reinterred in a tomb under a stone inscribed, "Honor to whom honor is overdue." Rafinesque applied to join the Lewis and Clark Expedition, but was twice turned down by Thomas Jefferson. 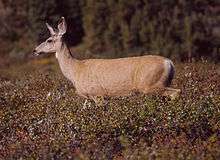 After studying the specimens collected by the expedition, he assigned scientific names to the black-tailed prairie dog (Cynomys ludovicianus), the White-footed Mouse (Peromyscus leucopus) and the mule deer (Odocoileus hemionus). Rafinesque was one of the first to use the term "evolution" in the context of biological speciation. "The truth is that Species and perhaps Genera also, are forming in organized beings by gradual deviations of shapes, forms and organs, taking place in the lapse of time. There is a tendency to deviations and mutations through plants and animals by gradual steps at remote irregular periods. This is a part of the great universal law of perpetual mutability in everything. Thus it is needless to dispute and differ about new genera, species and varieties. Every variety is a deviation which becomes a species as soon as it is permanent by reproduction. Deviations in essential organs may thus gradually become new genera." In the third edition of On the Origin of Species published in 1861, Charles Darwin added a Historical Sketch that acknowledged the ideas of Rafinesque. 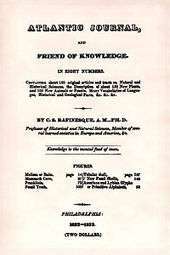 Rafinesque's evolutionary theory appears in a two-page article in the 1833 spring issue of the Atlantic Journal and Friend of Knowledge (a journal founded by himself). Rafinesque held that species are not fixed, they gradually change through time. He used the term "mutations". He also held the view that evolution had occurred "by gradual steps at remote irregular periods." This has been compared to the concept of punctuated equilibrium. For over a century after Rafinesque's publication, the Walam Olum was widely accepted by ethnohistorians as authentically Native American in origin. But, as early as 1849, when the document was republished by Ephraim G. Squier, Henry Rowe Schoolcraft, an ethnologist who had worked extensively in Michigan and related territories, wrote to Squier saying that he believed the document might be fraudulent. In the 1950s the Indiana Historical Society published a "re-translation" of the Walam Olum, as "a worthy subject for students of aboriginal culture". Since the late 20th century, studies especially since the 1980s in linguistic, ethnohistorical, archaeological and textual analyses, suggest that the Walam Olum account was largely or entirely a fabrication. Scholars have described its record of "authentic Lenape traditional migration stories" as spurious. After the publication in 1995 of David Oestreicher's thesis, The Anatomy of the Walam Olum: A 19th Century Anthropological Hoax, many scholars concurred with his analysis. They concluded that Rafinesque had been either the perpetrator, or perhaps the victim, of a hoax. Other scholars, writers, and some among the Lenape continue to find the account plausible and support its authenticity. Rafinesque made a notable contribution to North American prehistory with his studies of ancient earthworks of the Adena and Hopewell cultures, especially in the Ohio Valley. He was the first to identify these as the "Ancient Monuments of America." He listed more than 500 such archaeological sites in Ohio and Kentucky. Rafinesque never excavated; rather, he recorded the sites visited by careful measurements, sketches, and written descriptions. Only a few of his descriptions were published, with his friend John D. Clifford's series "Indian Antiquities," eight long letters in Lexington's short-lived Western Review and Miscellaneous Magazine (1819-1820). Clifford died suddenly in 1820, ending his contributions. Rafinesque's work was used by others. For instance, he identified 148 ancient earthworks sites in Kentucky. All sites in Kentucky which were included by E. G. Squier and Davis in their notable Ancient Monuments of the Mississippi Valley (1848), completed for the Smithsonian Institution, were first identified by Rafinesque in his manuscripts. Rafinesque also made contributions to Mesoamerican studies. The latter were based on linguistic data which he extracted from printed sources, mostly those of travelers. He designated as Taino, the ancient language of the Caribbean island of Hispaniola. Others later also used the term to identify the ethnicity of indigenous Caribbean peoples. Although mistaken in his presumption that the ancient Maya script was alphabetical in nature, Rafinesque was probably first to insist that studying modern Mayan languages could lead to deciphering the ancient script. In 1832 he was the first to partly decipher ancient Maya. He explained that its bar-and-dot symbols represent fives and ones, respectively. In 1841 Thomas Nuttall named a new genus Rafinesquia after Rafinesque. He felt indebted to the naturalist, who had inspired his work and given Nuttall's Flora a positive review. The genus now contains two species, Rafinesquia californica Nutt. (California Plumeseed or California Chicory) and Rafinesquia neomexicana A. 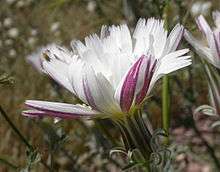 Gray (Desert Chicory or Plumeseed). In 1892 James Hall and J. M. Clarke proposed the genus name Rafinesquina in honor of Rafinesque for a number of fossil brachiopod species then belonging to genus Leptaena; the genus is now in the family Rafinesquinidae. 1810: Indice d'ittiologia siciliana ossia catalogo metodico dei nomi latini, italiani, e siciliani, e siciliani dei pesci, che si rinvengono in Sicilia disposti secondo un metodo naturale eseguito da un appendice che contiene la descrizione di alcuni nuovi pesci siciliani. Ill Opuscolo del signore C.S. Rafinesque Schmaltz. Messina. 1810: Caratteri di Alcuni Nuovi Generi e Nuove Specie di Animali e Piante della Sicilia. Palermo. 1814: Specchio delle Scienze. Palermo. 1814: Précis des Découvertes et Travaux Somiologiques. Palermo. 1814: Principes Fondamentaux de Somiologie. Palermo. 1815: Analyse de la Nature ou tableau de l'univers et des corps organisés. Palermo, 223 pp. 1817: Florula ludoviciana; or, A flora of the state of Louisiana. New York: C. Wiley & Co.
1819: "Dissertation on Water-Snakes", published in the London Literary Gazette. 1824: Ancient History, or Annals of Kentucky. Frankfort. 1828–1830: Medical Flora, a Manual of the Medical Botany of the United States of North America (two volumes). Philadelphia. 1830: American manual of the grape vines and the art of making wine. Philadelphia: Printed for the author. 1832–1833: Atlantic Journal and Friend of Knowledge. Philadelphia. 1836: A Life of Travels. Philadelphia. 1836: The Synoptical Flora Telluriana, With new Natural Classes, Orders and families: containing the 2000 New or revised Genera and Species of Trees, Palms, Shrubs, Vines, Plants, Lilies, Grasses, Ferns, Algas, Fungi, & c. from North and South America, Polynesia, Australia, Asia Europe and Africa, omitted or mistaken by the authors, that were observed or ascertained, described or revised, collected or figured, between 1796 and 1836. Philadelphia: H. Probasco. Pars Prima, Pars Secunda, Pars Tertia & Pars IV Et Ult. 1836: The American Nations (two volumes). Philadelphia. 1836: "The World", a poem. 1836–1838: New Flora and Botany of North America (four parts). Philadelphia. 1837: Notes to Thomas Wright's Original Theory, or New Hypothesis of the Universe. 1838: Genius and Spirit of the Hebrew Bible. Philadelphia. 1838: The American Monuments of North and South America. Philadelphia. 1839: Celestial Wonders and Philosophy of the Visible Heavens. 1840: The Good Book (Amenities of Nature). Philadelphia. 1840: Pleasure and Duties of Wealth. Betts, Edwin M. (1944). "The Correspondence between Constantine Samuel Rafinesque and Thomas Jefferson". Proceedings of the American Philosophical Society. 87 (5): 368–380. JSTOR 985288. Boewe, Charles (1980). "Editing Rafinesque holographs: the case of the short letters". Filson Club History Quarterly. 54 (1): 37–49. PMID 11616973. 1 2 3 Wilson, James Grant; Fiske, John, eds. (1900). "Rafinesque, Constantine Samuel". Appletons' Cyclopædia of American Biography. New York: D. Appleton. ↑ "The oddest of characters", American Heritage, April 1985; accessed November 17, 2010. ↑ "Book of Members, 1780–2010: Chapter R" (PDF). American Academy of Arts and Sciences. Retrieved September 9, 2016. ↑ Rafinesque, C. S. (1836). Life of Travels. pp. 46–49. Cited in Fitzpatrick 1911, pp. 21–22. ↑ Örstan, Aydin (2014). "Two early nineteenth-century uses of the term "evolution" to denote biological speciation". Archives of Natural History. 41 (2): 360–362. doi:10.3366/anh.2014.0255. ↑ "The Origin of Species". Preface to the Third Edition. ↑ Ambrose, Charles T. (2010). Darwin's historical sketch - an American predecessor: C.S. Rafinesque. Archives of Natural History 37: 191-202. ↑ Chambers, Kenton L (1992). "Evolution Before Darwin: The Musings of Constantine Rafinesque" (PDF). Kalmiopsis. 2: 5–9. ↑ Constantine Rafinesque (1832) "Philology. Second letter to Mr. Champollion on the graphic systems of America, and the glyphs of Otolum or Palenque, in Central America – Elements of the glyphs," Atlantic Journal and Friend of Knowledge, 1 (2) : 40-44. From p. 42: "This page of Demotic has letters and numbers, these represented by strokes meaning 5 and dots meaning unities as the dots never exceed 4." Ambrose, Charles T. (2010). "The curious death of Constantine Samuel Rafinesque (1783–1840): the case for the maidenhair fern". Journal of Medical Biography. 18 (3): 165–173. doi:10.1258/jmb.2010.010001. Barefoot, Daniel W. (2004). "A Curse on Transylvania. Transylvania University, Lexington, Kentucky". Haunted Halls of Ivy: Ghosts of Southern Colleges and Universities. John F. Blair. pp. 73–78. ISBN 978-0-89587-287-6. Beidleman, Richard G. (2006). "The early peripatetic naturalists". California's Frontier Naturalists. University of California Press. pp. 111–160. ISBN 978-0-520-23010-1. Belyi, Vilen V. (1997). "Rafinesque's linguistic activity". Anthropological Linguistics. 39 (1): 60–73. JSTOR 30028974. Boewe, Charles (1987). "Who's buried in Rafinesque's tomb?". The Pennsylvania Magazine of History and Biography. 111 (2): 213–235. JSTOR 20092097. Boewe, Charles (2000). "Introduction". In John D. Clifford. John D. Clifford's Indian antiquities. University of Tennessee Press. pp. i–xxxii. ISBN 978-1-57233-099-3. Boewe, Charles (2005). "Introduction: reprinting Rafinesque". In Charles Boewe. A C. S. Rafinesque Anthology. Jefferson, NC: McFarland & Company. pp. 1–14. ISBN 978-0-7864-2147-3. Chaddha, Rima (April 8, 2008). "Deciphering Maya: a Time Line". NOVA. PBS. Retrieved May 18, 2011. Fitzpatrick, T. J. (1911). Rafinesque: a Sketch of his Life, with Bibliography. Des Moines, Iowa: Historical Department of Iowa. Flannery, Michael A. (1998). "The Medicine and Medicinal Plants of C. S. Rafinesque". Economic Botany. 52 (1): 27–43. doi:10.1007/bf02861293. JSTOR 4256022. Gilbert, Bil (1999). "An "odd fish" who swam against the tide". Smithsonian. Retrieved May 8, 2011. Houston, Stephen D.; Stuart, David; Chinchilla Mazariegos, Oswaldo (2001). The Decipherment of Ancient Maya Writing. University of Oklahoma Press. ISBN 978-0-8061-3204-4. Hulme, Peter (1993). "Making sense of the native Caribbean". New West Indian Guide / Nieuwe West-Indische Gids. 67 (3&4): 189–220. doi:10.1163/13822373-90002665. Jackson, Brittany; Rose, Mark (2009). "Walam Olum Hokum". Archaeology. Meyer, David L.; Davis, Richard Arnold (2009). A Sea Without Fish: Life in the Ordovician Sea of the Cincinnati Region. Indiana University Press. ISBN 978-0-253-35198-2. Morhardt, Sia; Morhardt, Emil (2004). "Asteraceae (Compositae)". California Desert Flowers: an Introduction to Families, Genera, and Species. University of California Press. pp. 29–80. ISBN 978-0-520-24003-2. Oestreicher, David M. (2005). "The Tale of a Hoax: Translating the Walam Olum". In Brian Swann. Algonquian Spirit: Contemporary Translations of the Algonquian Literatures of North America. Lincoln: University of Nebraska Press. pp. 3–41. ISBN 0-8032-4314-6. OCLC 58721152. Warren, Leonard (2004). "Kentucky 1819–1826". Constantine Samuel Rafinesque: a Voice in the American Wilderness. University Press of Kentucky. pp. 79–99. ISBN 978-0-8131-2316-5. Binney, Wm. G. & George W. Tryon Jr, ed. (1864). The complete writings of Constantine Smaltz Rafinesque [sic] on recent & fossil conchology. A comprehensive work which contains all of Rafinesque's malacological writings, including all his plates. Boewe, Charles, ed. (1982). Fitzpatrick's Rafinesque: A Sketch of His Life with Bibliography, revised by Charles Boewe. Weston, MA: M & S Press. ISBN 978-0-87730-011-3. Boewe, Charles, ed. (2001). Mantissa: A Supplement to Fitzpatrick's Rafinesque. Providence, RI: M & S Press. ISBN 978-0-87730-016-8. Boewe, Charles, ed. (2003). Profiles of Rafinesque. Knoxville, TN: University of Tennessee Press. ISBN 978-1-57233-225-6. Boewe, Charles (2004). "C. S. Rafinesque and Ohio Valley Archaeology". Ancient America. Monograph Series. Barnardsville, NC: Center for Ancient American Studies. 6. Boewe, Charles (2011). The Life of C.S. Rafinesque, A Man of Uncommon Zeal. Philadelphia, PA: American Philosophical Society. ISBN 978-1-60618-922-1. Call, Richard Ellsworth (1895). The Life and Writings of Rafinesque: Prepared for the Filson Club and read at its Meeting, Monday, April 2, 1894 (Electronic reproduction , Kentuckiana Digital Library). Filson Club Publications, no. 10. Louisville, KY: John P. Morton. OCLC 51849712. Chambers, Kenton L (1992). "Evolution Before Darwin: The Musings of Constantine Rafinesque" (PDF). Kalmiopsis. 2: 5–9. Dupre, Huntley (1945). Rafinesque in Lexington, 1819–1826. Lexington, KY: Bur Press. Holthuis, L. B. (1954). "С. S. Rafinesque as a carcinologist: an annotated compilation of the information on Crustacea contained in the works of that author". Zoologische Verhandelingen. 25 (1): 1–43. Holthuis, L. B. (1955). "A supplementary note on the carcinological work of C. S. Rafinesque". Zoologische Mededelingen. 33 (26): 279–281. Sloan, De Villo (2008). The Crimsoned Hills of Onondaga: Romantic Antiquarians and the Euro-American Invention of Native American Prehistory. Amherst, NY: Cambria Press. ISBN 978-1-60497-503-1. OCLC 183392534. Stuckey, Ronald L. (1971). "The first public auction of an American herbarium including an account of the fate of the Baldwin, Collins, and Rafinesque herbaria". Taxon. 20 (4): 443–459. JSTOR 1218245. Wikimedia Commons has media related to Constantine Samuel Rafinesque. Rafinesque in Popular Science Monthly, Volume 29, June 1886.